The Massachusetts Department of Corrections clearly states that their mission is to employ officers and correctional support workers that will assist the state in its rehabilitative attempts while ensuring that communities and individuals remain safe. The Department's vision is to ensure that behavioral changes are positive and work to eliminate factors such as violence, recidivism, and victimization both inside and outside the correctional environment. Massachusetts' Department of Corrections is one of the state's largest employers; front line correctional staff work with 9,643 inmates in 18 correctional facilities across the state. Officers oversee a variety of inmate activities at a number of security levels. With the impetus on reducing recidivism and targeting prisoner needs for successful rehabilitation, economists studying the corrections industry predict that it will experience a steady increasing trend of 5% over the next 10 years, leading to the creation of almost 600 new jobs. At the federal, state, and local levels, there will also be job vacancies as officers retire, switch careers, and advance professionally. 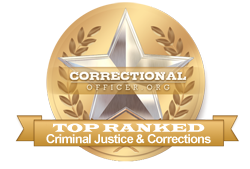 In order to see if the field of corrections is for you, scroll down for more information regarding correctional jobs in Massachusetts. Curry College ranks 1st in our latest rankings with 115 students completing programs in criminal justice and law enforcement administration out of a total a thousand students. Westfield State University ranks 2nd in our rankings with 225 students completing programs in criminal justice out of a total three thousand graduates. Anna Maria College ranks third in our latest rankings with sixty-three students graduating from programs in corrections and law enforcement administration out of a total 930 students in the 2012-2013 school year. Bristol Community College ranks 4th in our rankings with 175 students graduating from programs in criminal justice and law enforcement administration out of a total two thousand students in the 2012-2013 school year. University of Massachusetts-Lowell ranks 5th in our latest rankings with 441 students completing programs in criminal justice and law enforcement administration out of a total 7,000 graduates from the 2012-2013 school year. Roxbury Community College ranks 6th in our rankings with 33 students graduating from programs in criminal justice out of a total 628 students. Massasoit Community College ranks seventh in our rankings with ninety-four students completing programs in criminal justice and law enforcement administration out of a total 1,932 graduates from the 2012-2013 school year. North Shore Community College ranks eighth in our latest rankings with 109 students graduating from programs in criminal justice out of a total two thousand graduates in the 2012-2013 school year. Quinsigamond Community College ranks 9th in our rankings with 111 students graduating from programs in criminal justice out of a total two thousand students in the 2012-2013 school year. Springfield Technical Community College ranks tenth in our latest rankings with ninety-seven students completing programs in criminal justice out of a total two thousand graduates from the 2012-2013 school year. Bridgewater State University ranks eleventh in our latest rankings with 224 students completing programs in criminal justice out of a total 5,284 graduates in the 2012-2013 school year. Mount Ida College ranks twelfth in our rankings with 22 students graduating from programs in criminal justice out of a total 572 graduates. Berkshire Community College ranks 13th in our rankings with twenty-three students graduating from programs in criminal justice out of a total 618 graduates from the 2012-2013 school year. Bunker Hill Community College ranks 14th in our rankings with ninety-four students completing programs in law enforcement administration and criminal justice out of a total two thousand students in the 2012-2013 school year. Middlesex Community College ranks 15th in our latest rankings with 93 students completing programs in criminal justice out of a total two thousand graduates. Holyoke Community College ranks 16th in our latest rankings with 63 students graduating from programs in criminal justice out of a total a thousand graduates. Worcester State University ranks 17th in our latest rankings with eighty-eight students graduating from programs in criminal justice out of a total two thousand students. Salem State University ranks eighteenth in our latest rankings with 133 students graduating from programs in law enforcement administration out of a total 4,234 students from the 2012-2013 school year. Nichols College ranks 19th in our latest rankings with twenty-two students completing programs in law enforcement administration out of a total 758 students. Quincy College ranks twenty in our latest rankings with 30 students completing programs in securities services administration and management and law enforcement administration out of a total 1,152 students from the 2012-2013 school year. After the tier 2 assessments have been completed, candidates can expect a phone call to schedule an interview. If the interview is completed successfully, candidates will receive notice of enrollment at the Basic Training Academy - a ten-week program that teaches new recruits the policies and operating procedures of the Massachusetts DOC. Candidates who successfully complete the Basic Training Academy course will be considered certified and awarded with their first job posting. One of the ways that the state of Massachusetts strives to serve and support correctional officers is through strong working conditions and salary opportunities. Currently, the median income for front-line correctional officers throughout the state is considerably higher at $67,600 than that of the national median income. According to the occupational profile for the state of Massachusetts, http://www.careerinfonet.org/occ_rep.asp?next=occ_rep&Level=&optstatus=011000000&jobfam=33&id=1&nodeid=2&soccode=333012&menuMode=&stfips=25&x=39&y=8 published by CareerInfoNet.org, state and national trends predict a 5% increase in correctional officer jobs by 2022 putting the state exactly equal with national growth. For residents of Massachusetts, this rate translates into 200 job openings per year. The table below lists career information retrieved from the Bureau of Labor Statistics for correctional officers in Massachusetts. The table is sorted by total employment, with the largest metropolitan areas listed first.